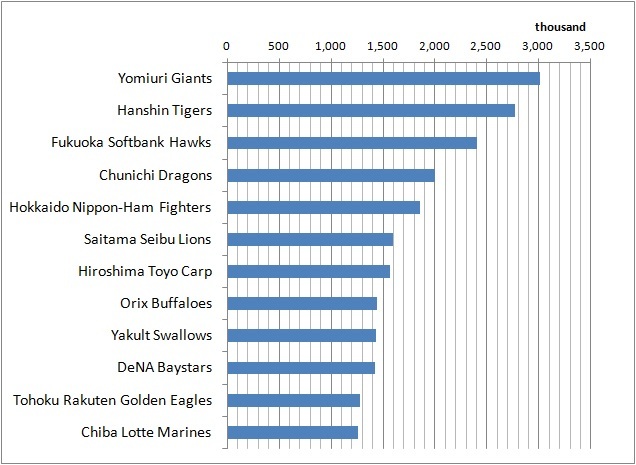 Attendance Number of Japan Professional Baseball 2013 - How much is it in Tokyo? To see 2014 season version, click "2014 Season Attendance Figures of NPB". The following shows number of attendees which each host team got in the 2013 season. Japanese baseball organization Nippon Professional Baseball has 12 teams in 2 leagues (Central and Pacific). The first table is for Central League of Nippon Professional Baseball. Central League consists of 6 teams. Giants are the most popular team, and it is a little bit difficult to get a ticket for Giants' game. The second table is for Pacific League of Nippon Professional Baseball. It also consists of 6 teams. Golden Eagles defeated Giants in 2013 Japan Championship Series and became the winner. Source is Nippon Professional Baseball. Statistics of these leagues are the below.